The research lays the foundations for futuristic soft active matter with highly distributed and tightly integrated sensing, actuation, computation and control, said Dr. Samuel Stanton, manager of the Complex and Dynamics Systems Program within the Engineering Sciences Directorate at the Army Research Office, an element of the U.S. Army Research Laboratory, located at Research Triangle Park in Durham, North Carolina. ARO funds research to initiate scientific and far-reaching technological discoveries in extramural organizations, educational institutions, nonprofit organizations and private industry that may make future American Soldiers stronger and safer. The research team, led by Professor of Physics Dr. Seth Fraden of Brandeis University, drew inspiration from the mesmerizing sinuous motion of a swimming blue eel and puzzlingly large gap between how natural systems move and the lack of such coordinated and smooth movement in artificial systems. Fraden’s work sought to answer key questions, such as why is there such a void between the animate and inanimate that we never confuse the two, and if engineers could create materials with similar attributes to living organisms, but constructed from inanimate objects, can we do so using only chemicals and eschew use of motors and electronics? Looking deeper, Fraden studied how a type of neural network present in the eel, named the Central Pattern Generator, produces waves of chemical pulses that propagate down the eel’s spine to rhythmically drive swimming muscles. Fraden’s lab approached the challenge of engineering a material mimicking the generator by first constructing a control device that produces the same neural activation patterns biologists have observed. There, they created a control system that runs on chemical power, as is done in biology, without resorting to any computer or electromechanical devices, which are the hallmarks of manmade, hard robotic technology. A breakthrough was made when Fraden and his team realized that the same CPG dynamics could be captured on a non-biological platform if they used a well-known oscillating chemical process known as the Belousov–Zhabotinsky reaction. The lab developed state-of-the-art fabrication techniques for soft materials engineering artificial chemical networks at the nanoscale that, altogether, would be capable of producing a wide variety of patterns. Their resulting robust chemical networks produced distributed dynamic patterns identical to the eel’s Central Pattern Generator. The research appear as the cover article of the March 7 issue of a U.K. journal, Lab on a Chip, which is a peer-reviewed scientific journal publishing primary research and review articles on any aspect of miniaturization at the micro and nano scale. The work earned distinction as one of the journal’s “hot articles” due to its particularly high scores earned in the scientific review process. As a next step, Fraden’s lab will take on the challenge of transferring the information coded in the dynamic patterns from the chemical networks to create a targeted mechanical response within a novel chemo-mechanical gel. 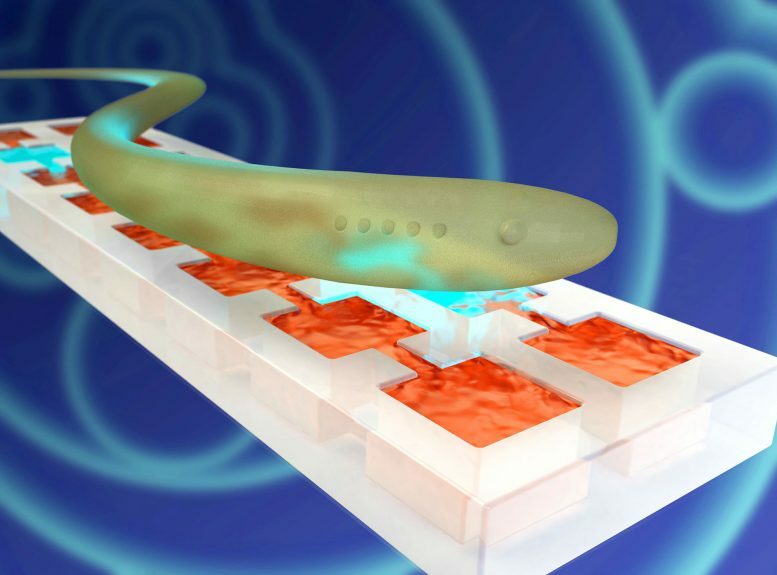 This could transition the research from artificial material mimicking neural tissue to artificial tissue now mimicking neuromuscular tissue. 1 Comment on "Scientists Mimic Neural Tissue in Next-Generation Soft Materials"
So, when I read this my first thoughts were is it — Advanced Federation technology which adds synthetic neural cells to a soft-sided circuitry module, designed to organize information more efficiently and speed up response time. The new feature is standard on Intrepid-class starships such as the U.S.S. Voyager. Their organic elements are, however, subject to damage from organic infection.